TORONTO — Apollo Health and Beauty Care has been awarded the prestigious Sam's Club Supplier of the Quarter Award for the 2017 retail period. This accolade is generally presented to tier one CPG manufacturers who dominate prime shelf space in this Top 10 retailer's chain of stores. Apollo is one of the largest private label and retailer branded personal care manufacturers in North America. Apollo Health and Beauty Care has been awarded the prestigious Sam’s Club Supplier of the Quarter Award for the 2017 retail period. This accolade is generally presented to tier one CPG manufacturers who dominate prime shelf space in this Top 10 retailer’s chain of stores. Apollo is proud to be one of the largest private label and retailer branded personal care manufacturers in North America. We strive to provide innovative and high quality products at competitive pricing to our valued customers. Apollo’s commitment to value-added customer service and product innovation excellence truly sets us apart from other marketplace suppliers and makes us a logical, reliable and formidable supply chain partner. 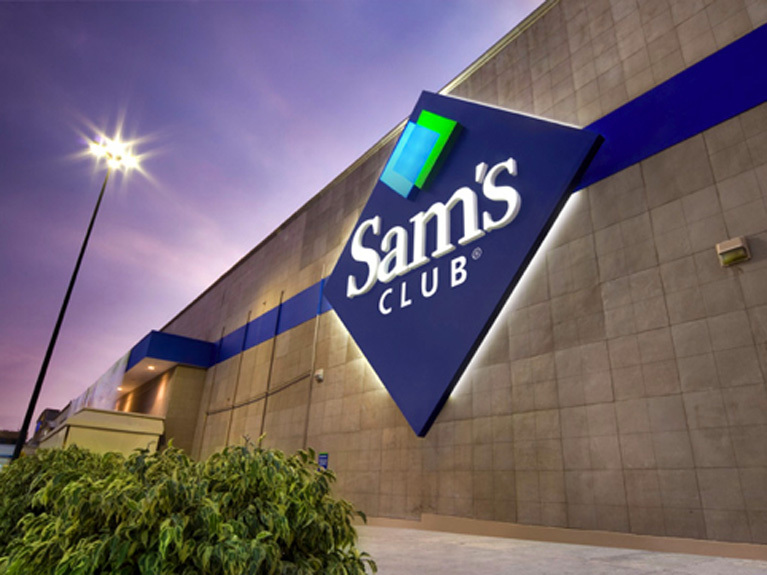 Apollo cherishes the Sam's Club Award's performance acknowledgement and we look forward to actively progressing our long standing association and partnership with Sam's Club for the benefit of all Club members. TORONTO, ON--(Marketwired - October 27, 2016) - Apollo has been an active participant in the Workplace Safety & Prevention Services (WSPS) Safety Group (Concord Chapter) since 2010. This is a voluntary performance-based rebate program developed by the Workplace Safety & Insurance Board (WSIB) which encourages Ontario employers to develop and continuously improve their occupational health & safety systems and overall health & safety performance. In 2015 Apollo entered into the second phase of this program, called the Safety Group Advantage Program (SGAP), which focuses on auditing, reporting and continuously improving existing health and safety management systems (HSMS) which contributes to Apollo's vigorous safety culture with commitment and participation at all levels within the organization. Left to Right: Christine LaRochelle, Director of Human Resources, Apollo Health and Beauty Care; Lawrence Medas, Safety Group Program Consultant, WSIB; Elizabeth Witmer, Chair of the WSIB; Craig Fairclough, Safety Group Chapter Leader, WSPS. Apollo was recognized this morning in two special ways for its outstanding commitment to safety in the workplace at the WSPS Safety Group Meeting held in Concord, Ontario. First, Apollo was commended by Lawrence Medas, lead Safety Groups Program Consultant for the WSIB, for our exceptional efforts in our first year of the SGAP program in 2015. To the Concord Chapter members, Lawrence acknowledged the high standard of auditing detail, meaningful results, and actionable improvements that Apollo noted and implemented, in addition to the 100% validation audit score we achieved when scrutinized by the WSIB - a level of excellence, Lawrence commented, not typical of first year participants. 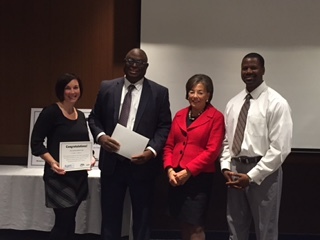 Second, Apollo was one of several recipients of a Certificate of Achievement for the 2015 Safety Group year, which was signed and presented by WSIB Chair Elizabeth Witmer. Apollo was highlighted as a leading contributor to the Concord Chapter's overall high results for the 2015 participation year, resulting in total cash rebates for members of the Concord Chapter in excess of $130,000 (the highest of all Chapters; Province-wide, the WSIB will be issuing a total of $6.2M to Safety Group members for their participation in the 2015 calendar year of the program). Apollo can attribute its stellar safety record directly to its participation in the WSPS Safety Group Program. The formalized and systematic approach to evaluating and mitigating risks and managing results has contributed to zero lost time accidents in excess of three years in a high-speed manufacturing facility that operates 24/7. Furthermore, our safety record continues to improve year over year with a decline in reportable accidents by 63% since 2013. We look forward to completing our 2016 program year in November and returning for our eighth year in Safety Groups in January 2017. TORONTO, ON--(Marketwired - August 15, 2016) - Think Green Solutions and Toronto Hydro congratulate Apollo Health & Beauty Care on the completion of a major energy efficient industrial lighting upgrade.Think Green Solutions is pleased to Congratulate Apollo Health& Beauty Care on the completion of a major energy efficiency upgrade at their Toronto Facility. Apollo Health & Beauty Care, a world leader in health & beauty product manufacturing and distribution, chose Think Green Solutions as their vendor of choice back in December of 2015 for a major energy efficient industrial lighting upgrade. The project, which took roughly 6 months to complete, involved replacing over 4000 T5 Fluorescent tubes with Think's innovative LED T5 Easy Swap Tube, the largest retrofit of its kind to date in Canada. The project also involved replacing nearly 1500 T8 Fluorescent tubes with Think's LED T8 Easy Swap Tube, and dozens of high powered Exterior lights with Long lasting, energy efficient Induction Lighting for better safety and security around their facility. Perhaps the best part of this project is that is also stands to significantly benefit the environment by reducing nearly 1,000,000 Kwh's per year in electricity consumption, which translates into 1,439,607 lbs. of CO2 emission reductions per year, or the equivalent of planting 27,769 trees. Think Green Solutions applauds Apollo Health & Beauty Care for taking such a large and innovative step forward at such an important time in human history when it comes to environmental sustainability, climate change responsibility, and economic accountability. May it inspire other Toronto businesses to follow suit. TORONTO, ON--(Marketwired - January 12, 2016) - Hand sanitizers serve the purpose of cleansing your skin. Their functionality as a supplement to washing your hands with soap and water is acknowledged. One may notice, however, that after repeated use of regular hand sanitizers skin may become red, dry and sore. This development results from post use unprotected skin becoming contaminated by various microbes, which leads to irritations. To address these irritations, Apollo has developed a pre-biotic technology to ensure that our sanitizer not only sanitizes and disinfects the skin, but that it also preferentially supports the positive bacteria that your skin needs to retain in order to combat common irritations. This specially blended formula helps to naturally restore skin's moisture and assists in strengthening the immune system, which in turn, promotes good microbiological fauna on the skin. This means that it does not kill the good bacteria that your skin needs in order to remain healthy. This pioneering technological advancement promotes superior comfort while delivering skin hygiene always available through the use of Apollo hand sanitizers. TORONTO, ON--(Marketwired - January 07, 2016) - Sunscreens are meant to protect our skin from the sun's harsh UV rays and can help prevent some skin cancers. Sunscreens are a very complex mixture of emulsified liquids which are stabilised with complex emulsifiers and structuring agents. They still do not protect the skin completely as has been evidenced by recent data that has forced the US Congress to demand that the FDA approve alternative ultraviolet light ray sunscreens owing to the observance of increased carcinoma (a type of skin cancer) on certain occasions of increased sunscreen usage. SPF, sun protection factor, is a relative measure of how long a sunscreen will protect you from ultraviolet UVB rays. Standard SPF systems require sunscreen levels to be half that of the declared SPF. Apollo has developed sunscreens that are nearly emulsifier free, allowing for a more uniform spread of sunscreen agents across the skin and thus increasing sunscreen efficiency. This means that less sunscreen is required to do the requisite job. The minimal use of emulsifier means that Apollo sunscreens are inherently more water resistant and, combined with our natural Oleosome technology, possessed of enhanced sunscreen photo-stability. Photo-stability means that your sunscreen's UV filters do not degrade or break down when exposed to sunlight. To further enhance the performance of our sunscreen, Apollo has added a significantly effective antioxidant package that neutralises the free radicals that are created at the surface of the skin when sunlight interacts with the skin. This combination of technologies represents a manifest advancement in skin care where UV rays present adverse impact to skin. TORONTO, ON--(Marketwired - January 06, 2016) - While mouthwash is not a substitute for brushing your teeth, it does reach all areas of your mouth which your toothbrush and floss cannot reach. It is a great way to combat bad breath, promote tooth and gum care and actively challenge the growth of bad bacteria. Current technology mouthwashes provide the feeling of freshness through the stimulation of taste receptors on the tongue. This methodology has limitations to the type of sensation you feel and decreases the longevity of that fresh feeling. Moreover, most mouthwashes use sweeteners that can be used by the bacteria in your mouth to cause cavities. Apollo's revolutionary CoolBoost technology stimulates the cold receptors in the mouth cavity rather than taste receptors on the tongue. This advancement offers substantive benefits. It is significantly less irritating to the tongue allowing the tongue to properly taste foods and beverages yet maintaining the cooling freshness impact sought by users. Additionally, the cooling freshness effect can be extended for upwards of 3 hours. Importantly, Apollo has developed formulas which avoid cavity-causing sugars and polyols (sugar alcohols) and, instead, adopt sweeteners that are not metabolised by the cavity-causing bacteria in your mouth thereby minimising the possibility of cavities. This progression of technology in oral care represents a material enhancement in the quality offering of mouthwash and leapfrogs existing strategies in the marketplace. We at Apollo Health and Beauty Care applaud the world-leading efforts of the Peter Munk Cardiac Centre in transforming the future of cardiac and vascular care for patients across Canada and thew orld by integrating excellence in clinical care, research, innovation and teaching. Apollo Health and Beauty Care has engaged the services of a leading global executive development organization in order to optimize internal leadership development training for managerial staff. This unique learning opportunity is a custom program designed around Apollo's strategic market positioning and focuses on building leadership capability needed to enhance our operations today and to ensure a steady supply of the right and ready talent for tomorrow's future needs. This program will coach and guide participants through training and practical on-the-job learning to ensure maximum transfer and retention of knowledge. Building upon our recruitment strategy, Apollo is securing its future leaders and preparing them for the dynamic challenges of the ever-changing retail and manufacturing landscape. Supported by Apollo's Corporate Mission, this learning initiative will assist in driving transformative change, increase our competitiveness, elevate our productivity and generate new levels of excellence in customer satisfaction. Apollo Health and Beauty Care was pleased to attend the Mayor's Employment and Jobs Reception hosted by Mayor John Tory on Wednesday, March 25th at Toronto City Hall. Apollo has been a proud supporter of the Partnership to Advance Youth Employment (PAYE) for the past three years, which is a joint initiative between private sector employers and the City of Toronto working together to increase access to economic opportunities for Toronto youth. This initiative embodies not only the fundamental morale values of embracing diversity and addressing inequality but it also captures core business principles aimed at mitigating the looming labor shortage. "Creating opportunities for bright, talented and ambitious youths only benefits our organization," says Richard Wachsberg, Chairman of Apollo Health and Beauty Care, "and we are so pleased to be able to help these youths in realizing their career aspirations and reaching their fullest potential." Apollo Health and Beauty Care has successfully completed its fifth year in the Workplace Safety and Prevention Services Safety Group Program. This voluntary program is a performance-based rebate program developed by the Workplace Safety and Insurance Board (WSIB) and encourages Ontario employers to develop and continuously improve their occupational health and safety systems and overall health and safety performance. Apollo has consciously pledged to create and maintain a vigorous safety culture with commitment and participation at all levels of the organization. "Not only is it good business sense to place safety as a top priority in the workplace, but it demonstrates commitment to our valued employees and accountability at all levels of the organization to do things the right way," says Charles Wachsberg, President and Owner of Apollo Health and Beauty Care who takes a personal interest in selecting and monitoring the progress of Safety Group Elements each year. Apollo Chairman Richard Wachsberg acknowledges he "looks forward to reviewing our annual health and safety objectives and celebrating our achievements and successes with our staff." With Apollo entering the SGAP program for employers in their sixth year of participation, Richard Wachsberg notes that "this new auditing and reporting phase will bring us to the next level of health and safety excellence." . Twelve years ago, Apollo Health and Beauty Care endeavoured to become an honoured member of Canada's 50 Best Managed Companies. Not only did Apollo gain acceptance into the 50 Best faction, but we achieved re-qualification status each year thereafter attaining membership in the Prestigiously Platinum Club; companies who have won the Best Managed award for at least six consecutive years. The coveted 50 Best Managed Companies Platinum Club is obtainable only by employing dedicated professionals who strive each day to perfect their craft and continually improve upon Apollo philosophies, creations and products in a determination to surpass greatness. From ideation to creation, our business could not be possible without the creativity and genius of our Research and Development Staff, the tenacity and execution of our Sales and Product Development Teams, the collaboration between our Manufacturing Departments supported by our Quality Assurance Team, expedited by our invaluable Logistics Department -- all of which have together ensured optimized product delivery offerings to our cherished clients. Thank you Team Apollo for another award winning year! 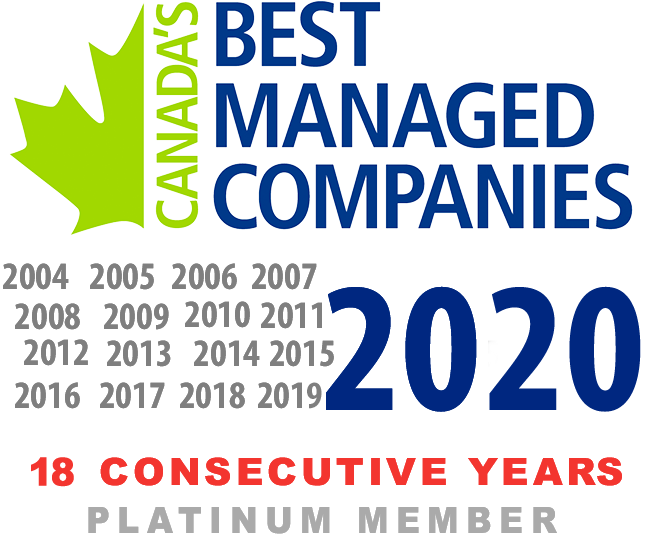 To all the new Canada's 50 Best Managed Companies winners this year, welcome to our Family! Your new status is an indication of a boundless business set out to accomplish great things. To our fellow Platinum Members, we are humbled to share your prestigious and prodigious status of accomplishment. We are now entering into our final phases for the implementation of our waste water treatment facility. What does this mean? As part of our company initiative to be good corporate citizens and our goals of both sustainability and reduction of environmental footprint, we have designed a system that captures all fluids that exit via waste streams and optimizes environmental impacts resulting therefrom. Specific SOPs related to this effort, from Preweigh to Batching to Filling will ensure best in class results. Firstly, we have successfully located a significant water well on our site and we have commissioned our well for use in our plant. "This is a significant win for the environment as we need not burden the City's systems with our requirements for water," states Charles Wachsberg, President of Apollo Health and Beauty Care. "This will reduce the overall load for the region in much the same way as our waste water treatment reduces the burden to water treatment facilities," states Apollo Health and Beauty Care's Chairman, Richard Wachsberg. Secondly, we created large underground cisterns, the purpose of which is to capture all rain water that reaches our roof. Instead of this water going to City storm drains, we collect the water and then reuse it to water our lawns. Once again, we have responded with sustainability initiatives which deliver a hugely positive impact to the environment and a reduced burden our community. It is no secret that society continues to emit greenhouse gases (GHGs) at an unsustainable rate. In recent years, we have seen an increased level of environmental consciousness with consumers actively looking for ways to curb their own emissions levels and consequently increasing their expectations of corporations to do the same. While we have had many environmental initiatives and commitments in the past, Apollo Health & Beauty Care is progressing its Environmental Sustainability Program (ESP) to help focus our ongoing effort to enhance the level and quality of carbon emissions generated through our operations. The ESP will be focused on managing various environmental aspects and impacts by specifically identifying, measuring and monitoring key environmental indicators that guide us in the implementation of this strategy and in achieving continuous improvement. As responsible members of the community we strive to conserve natural resources through innovative processes and continuous improvement initiatives with the goal of reducing, reusing, and recycling to minimize environmental impacts wherever possible. Charles Wachsberg, President of Apollo, confirms, "We are committed to integrating design for the environment into our facility and workplace operations by designing and manufacturing products in a manner that is safe, energy efficient and minimally impactful to the environment." Richard Wachsberg, Chairman of Apollo, states, "We are dedicated to promoting, maintaining, and improving environmental practices in the workplace through education and awareness at all levels." Apollo Health and Beauty Care is pleased to present our 2014-2018 Accessibility Plan..
Apollo has been listed on National Post Canada's 50 Best Managed Companies. Apollo retrofits all light fixtures in all plants and offices to high efficiency lighting resulting in a 25% gain in overall electrical efficiency. Ongoing efforts to go green have yielded material improvements in recycled material usage. Greater than 50% of all Apollo processed plastics and corrugated carton stock is comprised of post recycled material. Apollo teams up with Maple Leaf Sports and Entertainment to aid Haitian earthquake victims. 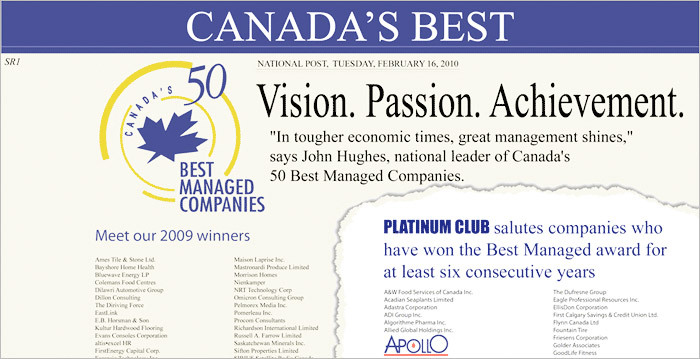 Apollo has been awarded Platinum status as one of Canada's 50 Best Managed Companies for 2009 ! Apollo Health and Beauty Care Corp.
Charles and Richard Wachsberg know an opportunity when they see one. In 1993, the private-label industry was just starting to come into its own, but health and beauty care companies had not tapped into this market yet. Enter the twin brothers. "We broke into this industry in its infancy here in Canada and truly helped define the early stages of its evolution, "says Charles Wachsberg, president and chief executive of Apollo. Today, Apollo manufactures and distributes personal care products on the world stage for companies such as Wal-Mart, Target and Loblaws. "We're in the U.S,. Mexico, Central and South America, and now the Middle, East. There is not a continent where we have not distributed our wares," Mr. Wachsberg says. He recently returned from Lebanon, where Apollo broke down political barriers to open the Middle East for Western Business. The Largest private-label health and beauty care products manufacturer in Canada with some 1,000 products, Apollo has also significantly saturated the U.S. marketplace and is now looking to the Pan Pacific to increase its market share. "We have been recognized as a leader for launching creative on-trend products, quickly and efficiently," Mr. Wachsberg says. "We offer the most attractive balance of uncompromised product quality and price competitiveness."